The Washington Post is not known for publishing articles describing the benefits of pesticide use. However, in a recent article about the development of a biotech potato in Ireland, a Post reporter described the current use of fungicides to control the late blight fungus. In the 1840s the Irish peasant population depended almost entirely on the potato for their diets. The late blight fungus destroyed the Irish potato crop in 1845 and 1846 and a million people died. Today, the fungus is well-controlled with regular fungicide spraying, a point made by the Post reporter…..
“The disease has become even more damaging in the past five years with the arrival of new, highly aggressive strains. Unchecked, blight can destroy entire crops in just days. From the end of May until harvest, farmers spray fungicides every seven to 14 days, depending on the weather. Without the sprays, the potato fields of Ireland would echo the destruction that began in 1845, when the blight took hold in Flanders and moved like wildfire to the British Isles. The native home of the Colorado Potato Beetle is the American West from which it has spread around the world eating potato plants. 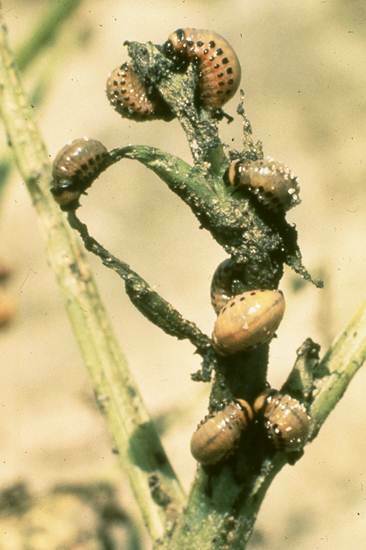 After adult beetles mate, each female deposits 500 eggs on a potato leaf. The larvae emerge and eat the leaves for about three weeks. Feeding by the beetles can defoliate plants, killing them, or significantly reducing their yields. Authors: Zhaoxu Zhou, Jinhuan Pang, et al. Title: Evaluation of the resistance of transgenic potato plants expressing various levels of Cry3A against the Colorado potato beetle (Leptinotarsa decemlineata Say) in the laboratory and field. Publication: Pest Management Science. 2012. 68(12):1595-1604. The pathogen Phytophtera infestans causes a disease of potatoes called “late blight”. The pathogen grows in potato plants, breaking down cell walls so that it can use the nutrients found within them. Severely infected plants have an acrid odor which is the result of dying plant tissue. In the 1800s, Irish peasants subsisted almost entirely on potatoes. The late blight fungus arrived in 1845 and destroyed 40% of the Irish crop. In 1846, 100% of the crop was destroyed. Over 1.5 million Irish died of famine and a comparable number emigrated to America and other countries. Today, the fungus is still present in Ireland and would destroy the crop again if not for fungicides. Title: Potato blight control in Ireland: a challenging problem. Publication: Pesticide Outlook. 1992. 13(4):28-31. Organic growers are severely limited in the tools that they can use to fight fungal infections since they cannot use effective chemicals. One unhappy result was severe losses to diseases in the organic potato fields of Northern California last fall. Title: Rhizoctonia and wilt create challenges for potato growers. 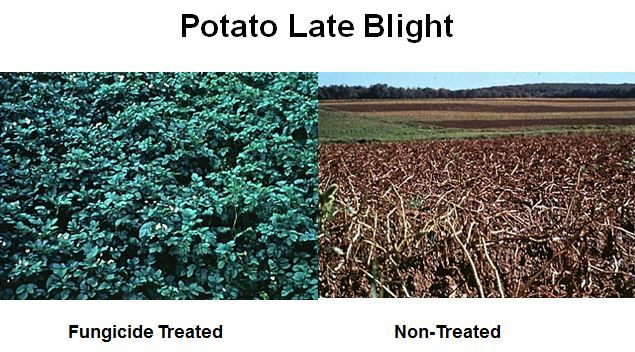 The disease of potatoes known as ‘early blight’ occurs earlier in the season than the well-known ‘late blight’ disease. Early blight is a significant problem in Wisconsin and Minnesota potato fields. Fungicides have been used for over 100 years to protect potatoes from early blight. Recent research in Wisconsin shows that modern fungicides continue to be most effective with newer chemistries expected to continue effective control into the future. Title: Evaluating the efficacy of fungicide programs for the control of potato early blight in the Central Sands of Wisconsin. Publication: American Journal of Potato Research (2012) 89:32.